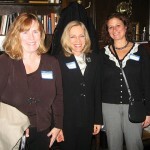 Over 80 women attended and learned how three successful Health Care Executives made major career transitions. The event brought together Valerie Donnelly, President/CEO at Donnelly Associates, Christine Shuster, President and CEO, Emerson Hospital and Lynn Malloy Stofer, Senior VP/CEO Medical Center Operations at Lahey Clinic to share their career paths, their career expertise and their passion for their work. Lynn spoke about how leaping should not be a solitary activity. She successfully changed career paths with help and support from someone in her existing WHCM network. Seeking advice from people knowledgeable about your field of interest helps to identify the best possible and interesting opportunities that you may not have initially considered. The advice from these talented women can guide each of us as we step closer to our future career leap. Please join us for this exciting opportunity to Network with colleagues and friends. Appetizers will be provided and a cash bar is available. WHCM Board members will also be there to give updates and answer questions about WHCM’s professional activities and programs. Because there is a limited capacity for this event, we recommend advanced registration. Past events have been well-attended and give members a valuable opportunity to meet and interact with each other. We are pleased to announce WHCM’s first Networking Event on November 12, 2009. Because there is a limited capacity for this event, we recommend advanced registration. This Forum provided the participants a clear understanding of the broader benefits of engaging in networking opportunities and provided tips and techniques for energizing networking efforts.